If you’re looking for something to do on Labour Day, Oak Hammock Marsh is one place that will be keeping nature lovers busy. The interpretive centre is offering a full slate of activities on Monday, including horse-drawn wagon rides from 12:30 p.m. to 4:30 p.m. and a geocache workshop at 2 p.m. The Free Press’ John White wrote an excellent article on geocaching last month. A treasure hunt will take place at various times throughout the day as part of a compass orientating course, which will help you navigate your way around the property to find specific items. Canoe adventures and marsh walks are also on the agenda. 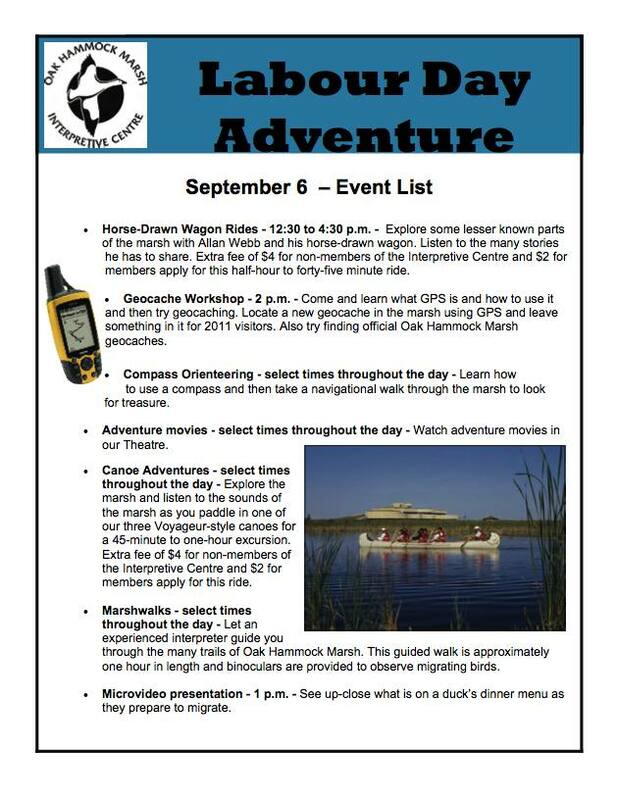 Download a complete list of what’s happening at Oak Hammock Marsh on Labour Day.